Winter continues… This week’s recipe for French Fridays with Dorie was just perfect for a cold week! Garbure is a meaty vegetable soup that truly sticks to your ribs. 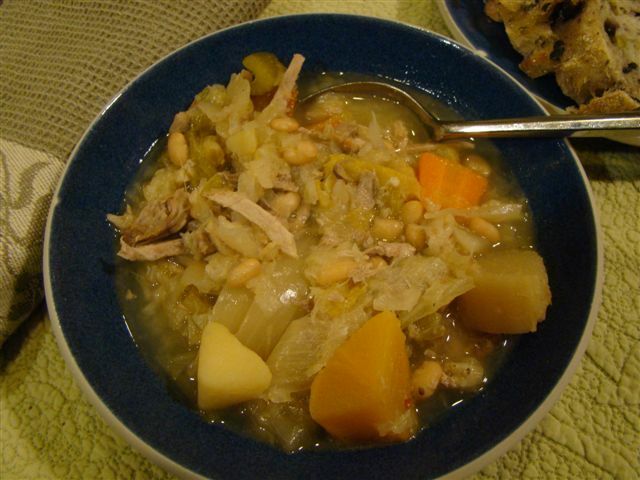 In Southwest France, where this soup hails from, garbure typically includes duck confit. Here in the US, though the ingredient list is long, this version can made from ordinary supermarket ingredients. This is the kind of soup that’s best prepared on a lazy afternoon. 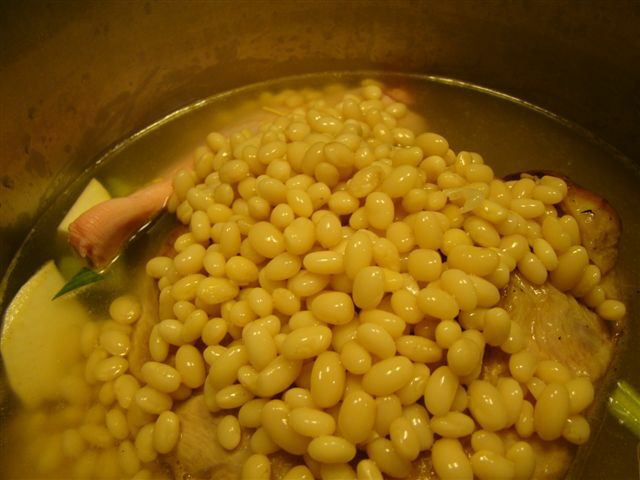 You start by soaking some little white (Navy) beans. Then, you brown a pork shoulder. That’s when I realized my large Dutch oven wasn’t going to be big enough for the batch of soup, so I switched over to the giant stock pot. 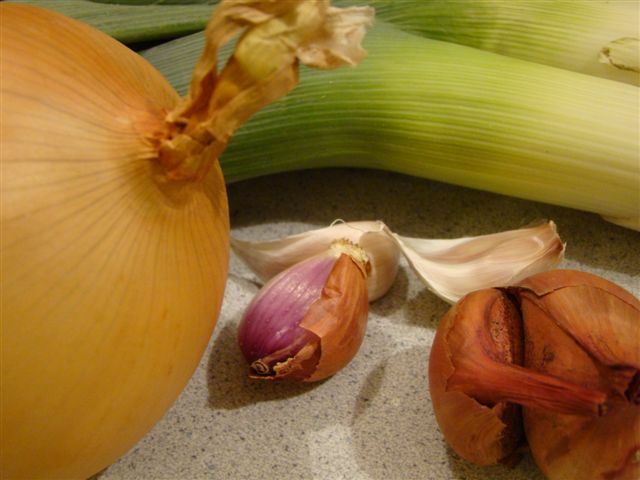 A variety of alliums (onion, leek, shallots AND garlic) are sautéed before adding big chunks of carrots, turnips, potatoes, and celery, the browned pork shoulder, a duck leg, the beans and lots of liquid. 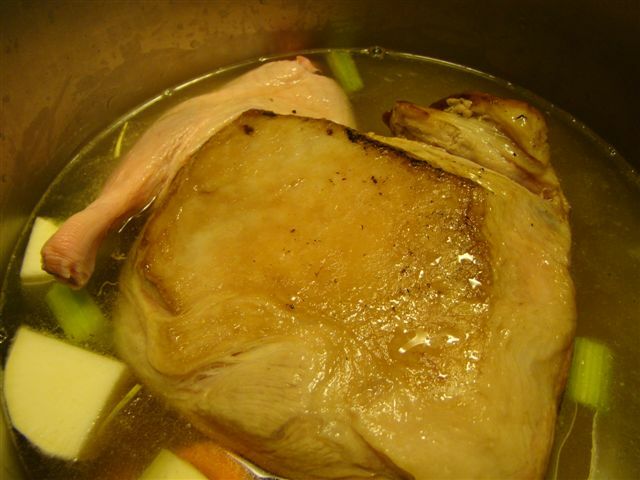 I used just 1 quart of chicken broth diluted with water because I felt the ingredients would add enough flavor. Oh, and I can’t forget the cabbage, piles of shredded cabbage. This simmers for an hour before adding some sliced sausage. I’m never quite sure what type of sausage to use when a recipe calls for “garlic sausage”. Is it kielbasa, bratwurst, or something else entirely? Google didn’t help. I found a fresh garlic-herb sausage at Whole Foods, so I used that. Because it wasn’t precooked, I pan-fried it before slicing and adding to the pot. Then, we had to wait for another hour of simmering. Finally, the pork and duck meat is shredded and added back to the pot. I’m not sure why my pork shoulder didn’t falling apart. Maybe it needed to cook longer? I had to chop the meat into thin strips rather than just shredding it with a fork. I know that food safety-wise, it’s not a good idea to put a big pot of hot soup into the refrigerator, warming up the rest of the food in there. I followed Howard’s favorite advice for this time of year: “Use the winter!” That means putting the pot out on the porch for a few hours or in the trunk of the car overnight. I opted for the car, though I’ll admit it reeked of cabbage for a couple of days afterwards. This recipe makes A LOT of soup. We enjoyed it for several satisfying lunches and dinners, and I froze 3 quart-sized containers for later. I also like this soup’s connection to charcuterie, at least at our house. The pork shoulder was the leftover half from a recent adventure making pork rillettes. And, the optional duck leg called for in the soup was the catalyst for Howard to make another batch of duck confit (his favorite, or should I say my favorite, of his kitchen DIY projects). The duck confit wasn’t ready to use in this soup, but it will be delicious next week served over lentils, a favorite dinner around here. Thumbs up from both of us. Every spoonful is full of flavor, lots of different flavors. I love ending the month on a winner! If you want to try this delicious soup, you can find the recipe in Dorie Greenspan’s book Around My French Table. To see what the other Doristas thought, check out their links here.